operator to have in the field jobs. Specially customizied 1 x universal handle and 1 x slim-fit handle with 6 torque adapters (0.6 ~ 3.0Nm) and 6 bits (Torx and Torx Plus) avaliable. It's a multi set for operator to have in the field jobs. Single SetSingle piece of Sloky Preset Torque Screwdriver (Torque Wrench) with 25mm and 50mm bits; TORX® TORX PLUS® and Hexagon avaliable. Three types of handle including Universal, Slim-Fit and T-Flying handle for ease of use and also various application like Cutting Tools, Shooting/Hunting, Circuit. 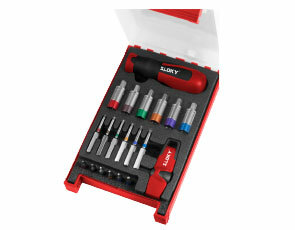 Adapter Kit Adapter of Sloky torque screwdriver with bits of Hex, Torx and Torx Plus for different Nm torque adapters. the only and smallest “ torque adapter “ with multi-national patents. 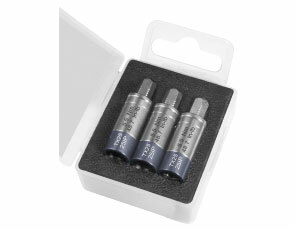 Sloky Torque Screwdriver – Change how we fasten the indexable cutting tools ! Standardize for fastening ! 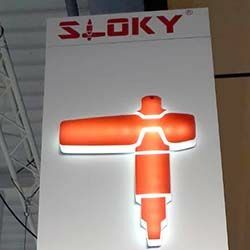 "SLOKY® " comes from the meaning of "SOLO KEY" in Taiwanese dialogue. It is defined from the position of patented adapter in torque screwdriver system as a solo performer. Patented adapter plays as a solo performer, with a unique feature to build whole product system. The torque's value is setting on the adapter; complied with various bits and handles become torque screwdrivers for tighten or loosen the screw. 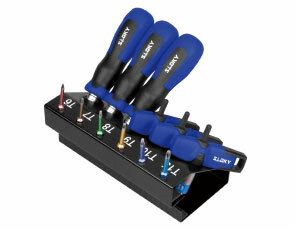 Sloky torque screwdriver, a predictable, replaceable and organized tool. It is considering to be used in industrial field having a greatest advantage of "no-over tighten". It prevents the damages of the screw and tool, in addition it provides a replaceable function to fit with driver bits having different shape and dimensions. Easily customize from 0.1 to 6Nm with small MOQ required for Cutting Tools, Shooting/Hunting, Circuit board, Tire pressure detector, Bicycle, DIY market, Drum, Lens, 3C devices and Golf club.